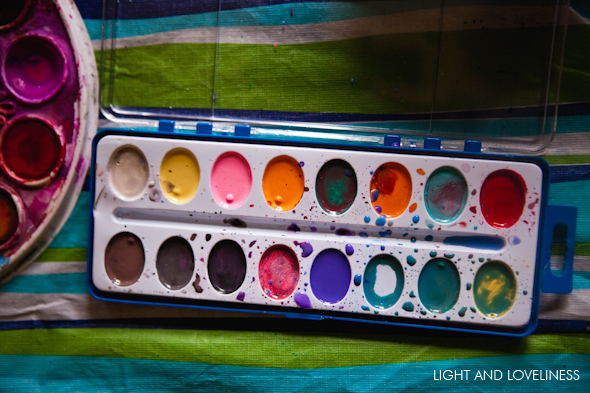 One thing I find is an easy but fun activity for my kids to do on a rainy day is to paint. 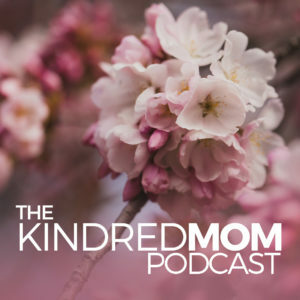 There was a time that I was adamantly against all activities that risked making a huge mess, and the idea of toddlers and preschoolers painting, in my house, with brushes and paint and water, made me break out into a cold sweat. For a while, I thought of it as a who-would-ever-do-that-to-themselves activity, and as such, we didn’t do much of it. Somewhere along the line, it occurred to me that if I spend my time and energy trying to keep them from making messes that inconvenience me, they are going to internalize a belief that they should not go, explore, do, and create with freedom…which is not at all what I want for them. 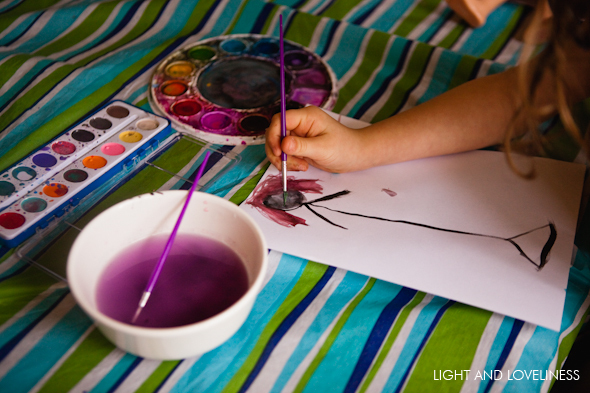 Granted, it still has to be manageable, but I’ve learned that the best things in life get messy and that’s ok. For those who aren’t so sure they are ready for a painting day, I put together a few tips that have helped me make this activity fun for them and not a big deal for me. 1. 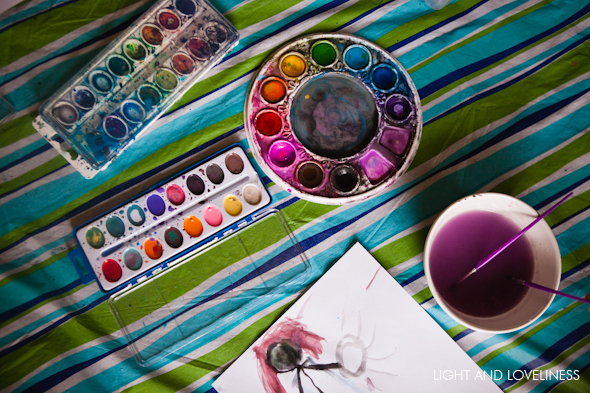 Get a cheap dollar store tablecloth to keep with the paint supplies. And if you don’t have one, use a kitchen trash bag laid out flat at each workstation. I just fold up the tablecloth (without cleaning it) and store it in the painting box. I sometimes keep the kitchen bags for a few sessions, but eventually I toss them out. 2. 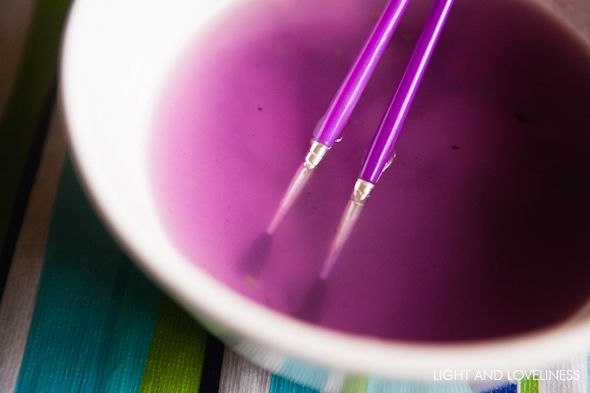 Use washable, watercolor paint. I’m sure we’ll try some other kinds in the future, but for now this is what works for us. I’m still searching for a ‘favorite’ brand. Crayola works fine, and RoseArt works but isn’t great, and our favorite paint thus far (the round palette) is an unmarked mystery brand and I’m not sure where it came from. 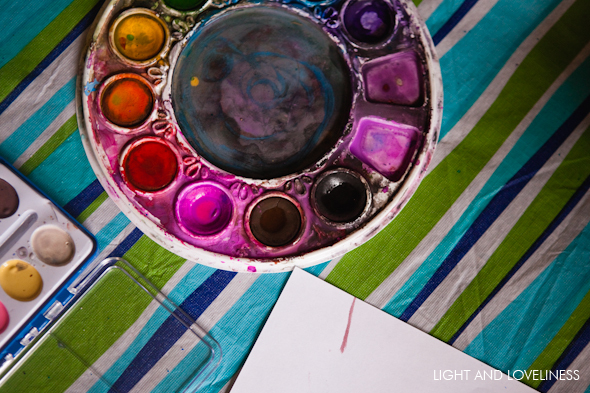 If you have a kids washable watercolor paint that you love, I’m all ears! 3. Use a ceramic bowl for the water. A cup will work, but a bowl, especially a heavy ceramic cereal bowl does not tip easily. I typically let each of the kids have their own bowls at their workspace instead of sharing, and they always enjoy making the water turn different colors. 4. 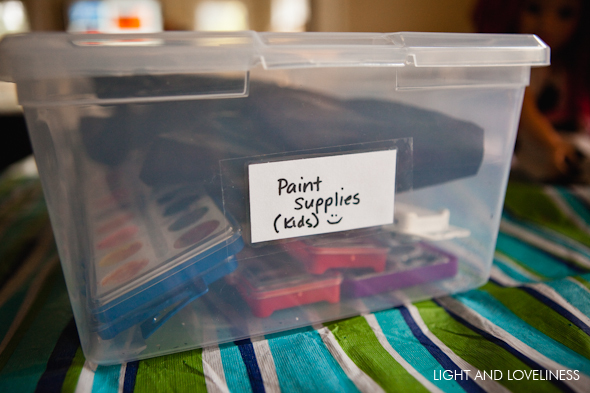 Find a great container to store all the paint supplies in one place. I actually use these clear plastic tubs all over the house. (more on my organizing methods, which are functional but not impressive or beautiful, at a later time). Our tub is labeled for the kids (any tub with “Kids” on it is open for their use…tubs not labeled with that are off limits)…plus I do have another tub of painting supplies for mommy. 🙂 The tub includes all our paint sets, brushes, kitchen bags/tablecloths, and sometimes the apron makes it in there. Most often, the kids take their shirts off of their own accord during painting. Well, actually, half of the kids spend 90% of the day in their underwear already, so the apron doesn’t get used much. 5. Don’t be afraid to display artwork for a while and then toss it out. Seriously, I if I have to save every paper they fill with paint or marker drawings or scribble words, I will drown in paper. I love celebrating their creativity for a time and then moving on. We often talk about how it is good to let go of some things to make room for new things, and everyone understands the drill around here. I do keep a tub (like the one pictured above) to drop the more ‘special’ art pieces that I plan to save for a longer time (or forever). That tub will be sorted and archived in a more permanent way whenever I get to it, but the tub is a quick way to get it out of my hair and keep it safe from little hands, gusts of wind, and the abominable paper monster. 6. 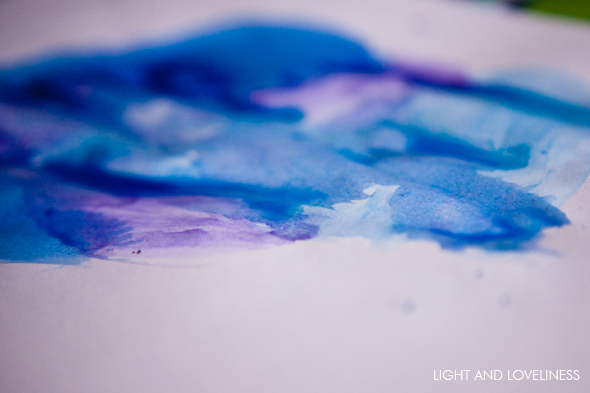 Paint alongside your kids, even if only for a few minutes. When I stop what I’m doing and sit down to paint with them, they absolutely love it. They like to watch how I do things, and they also like to chatter on and on while they fill their pages with beautiful colors. 7. Have everyone help clean up. My kids know (as with pretty much any ‘special’ activity at our house) that in order to participate in the fun, they must also participate in the cleanup. One usually dumps the water and rinses the bowls. Another rinses out the paintbrushes. And I have to say, they really love doing anything that requires cleaning stuff in the sink. And the last one puts all the paint sets and washed brushes back in the container. The only thing left for me to do is fold up the tablecloth and make sure all the painted pages get to the right place. Easy peasy. It’s actually one of the easiest-cleanup activities we do.